laura doodles: Illustration Friday - Space "Travel" PRINT! Illustration Friday - Space "Travel" PRINT! Hey everyone!! Man is it super hot here in Pennsylvania. I hope everyone is staying cool where they live. I have some exciting news to reveal in this post. My Etsy shop, VioletInk, has been re-opened and I am ready to sell some art prints of my illustrations!! The first illustration I added for your purchasing pleasure is "Space Fish," which also happens to work swimmingly with this week's Illustration Friday theme, "travel." 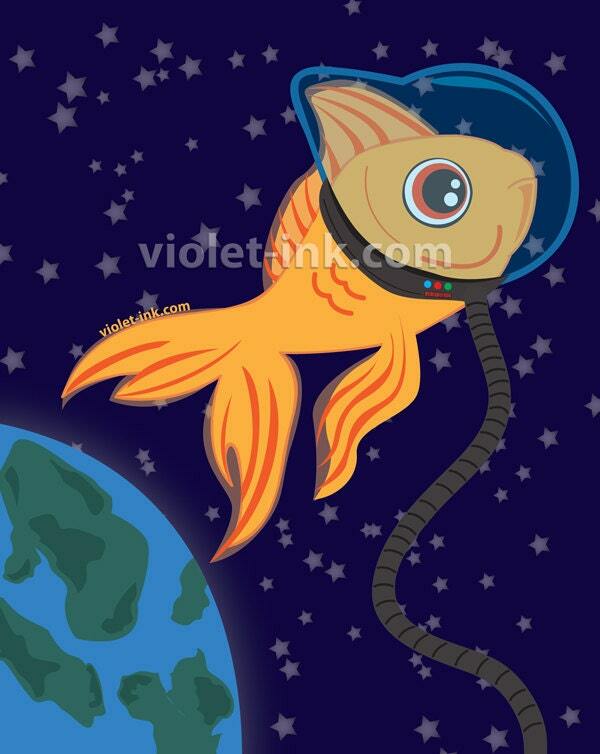 The first Goldfish to ever TRAVEL to outerspace!! Space can't be that different from life underwater. Our little guy glides his fins effortlessly through the stars. I will admit, I did cheat a little. This was an original piece I created back in 2010 but this is first time I am releasing it as a 8x10 print!! If you are interested in checking out my shop or purchasing this particular piece of artwork, just go to http://www.etsy.com/shop/violetink. Hope everyone has a great weekend!! It's super hot here in NJ too! I'm melting away! :P Anyway, what a lovely little piece of art, it definitely works with the theme of travel and it's super creative! Will definitely check out your shop soon too...just about to open my own so i'll be on etsy more often! Inspiration Post - Retro Robot Records! !